Causes, Symptoms and Treatments . White patches on tongue, or a completely white tongue, have several possible causes. However these possible causes are completely different in nature, so first, take a good look at your tongue and see exactly where the white patch on tongue is, or if you have a completely white tongue. If the top surface of your tongue is pretty much completely white, or grey-white, then it is likely to be a Coating On Tongue that can be removed by brushing. This may seem strange if you have not brushed your tongue before. But brushing your tongue morning and night after brushing your teeth will remove a whole lot of bacteria build-up from your tongue. The white/grey color will gradually fade, but it can take a few days of gentle tongue brushing, so don't scrub too hard! 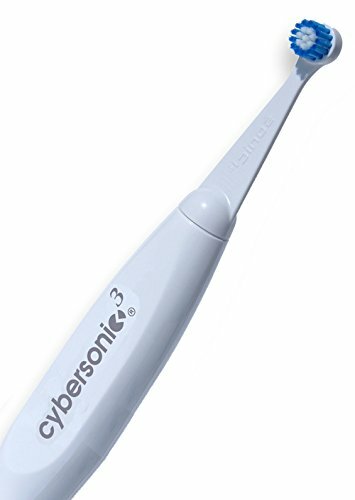 The BEST brush system for brushing your tongue is the Cybersonic 3 sonic toothbrush, which comes with a tongue cleaning attachment. This works extremely well, and I recommend it. If you have white patches on your tongue, you may have some bad breath from time to time. The best way to tackle this is with a TheraBreath Oral Rinse. This will help you to clean your tongue well, and eliminate any bad breath. Leukoplakia. This is a white or gray patch that develops on the tongue or the inside of the cheek. It can be on the top surface of the tongue, or off to one side. It is a reaction to a long-standing irritation of the surface of the soft tissues of the tongue. Constant rubbing or irritation causes the cells in the affected area to multiply more than usual, leading to the formation of a white patch. Although this is not dangerous on its own, a leukoplakia can be the starting point for a cancer to develop later on. The most common causes are rubbing from rough teeth, rough fillings, or dentures that don't fit properly and rub against your cheek or tongue. Smokers are also more affected than non-smokers. A leukoplakia is usually harmless, and goes away a few weeks after the cause of the irritation is removed. Oral thrush. This is also known as candidiasis. Oral thrush is an infection caused by a microscopic yeast, called Candida albicans. It can cause white patches on tongue that are a bit like cottage cheese. You can sometimes rub off a layer of the white deposit, leaving a raw area underneath. The white layer comes back in a day. This is quite different to the white tongue described above, where the whole tongue is white or grey, and brushing with a toothbrush gets rid of the white area. An Oral thrush yeast infection is most common in babies and older folk, in particular denture wearers. People with diabetes and people using a steroid inhaler for asthma or lung disease are also more likely to get thrush. Oral thrush can also occur after a course of antibiotics for some other problem. The antibiotics can upset the balance of bacteria in the mouth, allowing the Candida albicans (the yeast "bugs") to grow more quickly and get a foot-hold. To get a firm diagnosis, your doctor can take a small swab from your mouth. If a yeast infection is confirmed by the lab results, your doctor will likely prescribe an anti-fungal such as Fluconazole. This should settle it down within a few days. Oral lichen planus. If you have a series white lines on a milky-white background on your tongue with a lace-like appearance, you may have a condition called "lichen planus". It is also common on the inner surfaces of the cheeks. Again, there is evidence that in some cases, a chronic irritation may be a cause. Some specialists will advise replacing any old amalgam fillings that are close to the area on the tongue or cheek. I have done this myself a few times and always seen the white patch disappear within 4 weeks of replacing the filling. Doctors are otherwise often unable to pin down the exact cause of this condition, which may resolve on its own. If it becomes uncomfortable, however, like an ulcer, then you should get it checked by a dentist. So there are a number of possible causes of white patches on tongue. The first step is to try brushing it off with a toothbrush. If it comes off (or fades significantly after a minute or two of firm but gentle brushing, then it is likely that your white tongue was just a coating. If it doesn't come off, or leaves a red, raw surface underneath before re-forming within a day, go to your dentist for a check. We don't like white patches on tongue! Using the TheraBreath mouthwash below will help to prevent from getting a white tongue coating, AND reduce the bacteria living on your tongue!